After two matches, two goals, two draws and Melbourne Heart FC's 100th Hyundai A-League goal, there are a number of statistical talking points from the first two rounds. After two matches, two goals, two draws and Melbourne Heart FC's 100th Hyundai A-League goal, there are a number of statistical talking points from the first two rounds of the 2013-14 season. Melbourne Heart opened the season with a 0-0 draw in the Melbourne Derby, before taking it to the reigning champions Central Coast Mariners, only to settle for a 2-2 draw at AAMI Park. 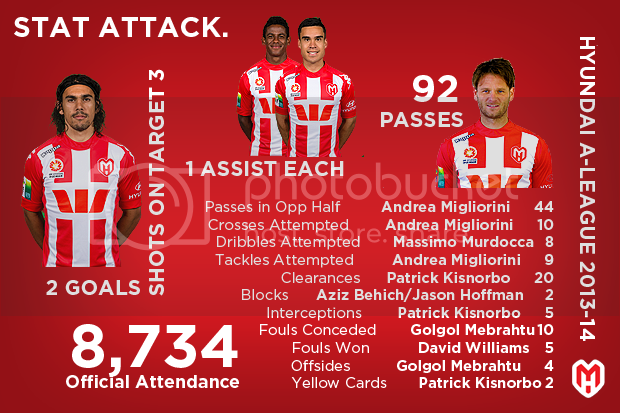 Check out some of the key statistical data from the first two matches to see which Melbourne Heart players have been the most influential thus far.